Many people suffer from back pain due to compression on the spine. Since we are upright all day long, our bodies are pushing down all day. That’s just what gravity does. What if you could change the force of gravity? That’s precisely what an inversion table does. 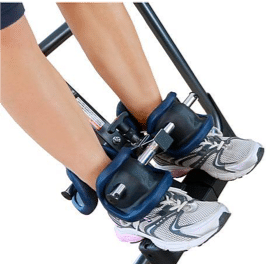 If you’ve never heard of an inversion table, or even if you have, you are probably wondering how to use an inversion table. I’ve wondered the same question when I heard about the benefits it could have to an aching back. It can be tricky to use, but this article will give you a step by step tutorial to help you conquer the inversion table trickery and help alleviate your back pain in minutes. Aside from an inversion table itself, nothing is needed to use it. Before you do anything, make sure you position the inversion table somewhere free from obstacles. You will need to swing the inversion table back to ensure that you won’t be hitting anything during your inverting. Once you know that it won’t be hitting anything, adjust the height on the inversion table to your height. There should be a pin that you pull and then slide the rod up or down to the marker that says your height. Once you have this correct, if you have lumbar support on your inversion table (not every model has this), you will want to adjust that to your desired position and degree of curve. This will add extra decompression to the lower back. To start, you should try the inversion table at a low degree of inclination. To ensure you don’t pass this spot, there is a strap that you can use to restrict the inversion table from swinging too far. This safety strap is connected to the crossbar. Grab the untethered end and attach it to the hole in the frame of the backrest. Put the inversion table to the maximum angle that you would like to invert too and tighten the strap to stop the table there. Now you can slowly step into the inversion table, keeping your weight off the back of the table. Place your feet into the footrests and secure them tightly. If you don’t do this step correctly, you could hurt yourself badly, so make sure that you understand how your particular model works by reading the instructions. It is essential when using an inversion table not to get on it and immediately hang upside down. This can shock your body. Instead, slowly push your body back into the inversion table holding the handles to get your body into a flat position. Hold this position for a couple of minutes to allow the blood to balance throughout the body. 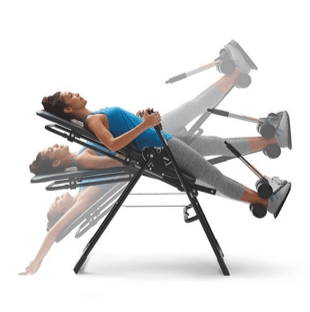 Once you feel comfortable in the flat position, rock the inversion table back and forth like on a rocking chair by throwing your weight from your lower body to your upper body. Make sure to hold the handles while you are doing this. Keep rocking for a couple of minutes and slowly roll to a greater degree as time goes by. This will allow your blood flow to adjust gradually. Now you can invert to the farthest degree that you set and stay there. At first, use only a couple of minutes hanging. You may not feel comfortable staying longer. While you hang to make sure that you are breathing deeply in through your nose and out your mouth, this will help your body to relax completely. When you get more accustomed to hanging for longer than a couple of minutes you can hang upside down and perform different stretches that will elongate the spine and take all the stress off each vertebra. To do these stretches, you need to release the handlebars and reach your hands over your head, stretching your arms toward the floor as far as you can. Stay in this position for about 30 seconds. Bend your torso to the left and angle your head to the left, keeping both arms extended overhead and angled to the left. You should feel a deep stretch in the right side of the shoulder and back. Reverse that stretch, bending to the right, feeling the time in the left side. Come back up as slowly as you inverted, making sure to give your body time to adjust and the blood flow to change slowly. This will make sure that a sudden rush of blood doesn’t make you dizzy. Use the handles to restrict the speed and slowly bend your knees when you are returning to an upright position. Do not release the footrests until you feel steady enough to walk. You might be surprised at how uneasy your footing is when you get off the inversion table. As you continue to use the inversion table, continue to progress in your maximum degree of inversion, aiming reach to the 180 degrees mark, which is entirely upside down. I hope you found value in this tutorial and can confidently use one without feeling like you’ll fall off. Fear is usually the main factor as to why people don’t use an inversion table, but it is quite simple when you break the steps down. If you still have questions, please feel free to leave them in the comments below and explore free to share this tutorial with anyone you know that has complained of back pain or that you know could benefit from using an inversion table.